Caribou's Taylor LaBreck eyes the hoop as she tries to go up for a shot against Hermon's Elizabeth Wyman at Caribou High School. 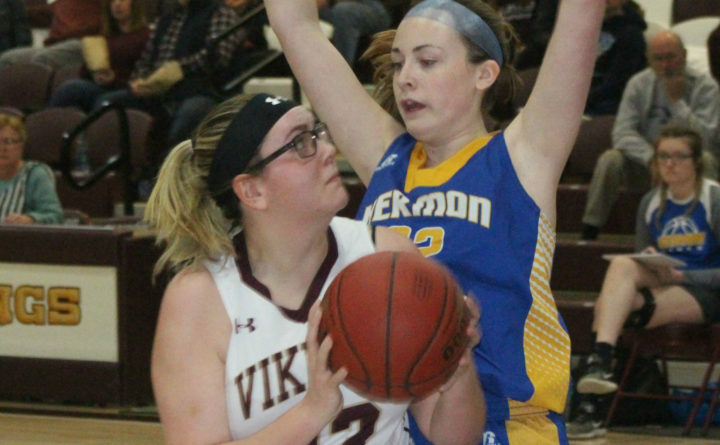 For basketball purists, a Class B North schoolgirl tournament final between the two remaining unbeatens, Waterville and Hermon, would be intriguing because of the contrast in styles. He said Hermon regularly uses six players, while Waterville plays 10. Hermon coach Chris Cameron concurred, saying Waterville is similar to its cross-river rival, Winslow. Hermon graduated four starters but players who were reserves last season have flourished in more prominent roles this season. Junior Paige Plissey was the backup point guard a year ago but is leading the Big East Conference in steals (7 per game) and assists (5 apg) while also averaging five points and five rebounds. She is Hermon’s smallest starter at 5-foot-7. Cait Tracy, a 5-10 senior center, is the only returning starter. She missed a large chunk of last season with a broken wrist but has made up for lost time by averaging 17 points and eight rebounds and 5-9 junior forward Grace Page is leading the team in rebounds (10 rpg) while averaging four points. Madisyn Curtis, a 5-8 senior guard, has contributed 12 points per game and 5-6 senior guard Brooke Cowan (7 ppg) is their best 3-point shooter. “All five could be our leading scorer in a game,” Cameron said. If Hermon needs offense against a zone defense, 5-10 freshman guard-forward Charlotte Caron can provide it coming off the bench. Sydney Gallop, a 5-7 freshman guard-forward, is a quick guard who excels against player-to-player defense. Freshmen Megan Tracy, Elizabeth Wyman and Madison Lebel, who all stand at least 5-10, will get some minutes. Rodrigue has a young team with two juniors and three sophomores in the starting lineup but he loves his team’s athleticism. Rodrigue also wants his team to take as many shots as possible. “The more shots you take, the more you make,” said Rodrigue, whose team scores a lot of points in transition after forcing turnovers. Sadie Garling, a second-team all-conference junior forward, has already made 51 three-pointers in 152 attempts and is averaging 14.5 points per game. She has made just 19 two-pointers. Garling missed 10 games last season with a broken finger. Sophomore guard Jayda Murray (8.3 ppg, 3.3 spg) is a complete player who can finish around the rim and has extended her shooting range, Rodrigue said. Junior center Maddie Martin (2.6 apg, 2.6 spg) has been the leading rebounder at 8.5 per game. “She is our best mover of the ball and she is very versatile. She can cover on the perimeter,” said Rodrigue. Sophomore point guard Paige St. Pierre (3.5 spg, 3.4 apg) makes a lot of things happen on the defensive end and sophomore center Lindsay Given is a cerebral player who rebounds well and is Waterville’s best free throw shooter, Rodrigue said. Arizona transfer Kali Thompson, a sophomore forward, headlines a cast of quality reserves along with senior Hannah LeClair and sophomore Abigail Saucier. Hermon (9-0) and Waterville (11-0) both play Thursday night. Hermon hosts a 9-1 Mount Desert Island team that recently lost to rival Ellsworth while Waterville visits Class B South entry Maranacook of Readfield (7-4). Cameron and Rodrigue are quick to point out that despite their early success, there is no shortage of top-notch contenders who could win Class B North. Recent history shows that a team seeded sixth or lower reached the regional final in three of the last four seasons. Last year, No. 6 Winslow won the state championship. Orono, which also is 3-8, has lost five games by seven points or less. The 16-team Class B North division covers a lot of territory. It is 227 miles by car from Caribou to Winslow. MDI is a veteran team led by seniors Julia Watras, Maddy Candage, Alexis Clarito and Hannah Chamberlain. The mother-daughter tandem of coach Heather Richards and sophomore guard Hannah Richards has guided Old Town to a 9-3 record after the Coyotes went 7-11 last season. Winslow, under first-year head coach Brenda Beckwith, is 8-3 and has plenty of experience back off last year’s state title team including Weslee Littlefield, Paige Trask and Maeghan Bernard. Ellsworth is 9-3 behind Trinity Montigny and its win over MDI was its first over the Trojans in more than 14 years. Maine Central Institute of Pittsfield is 6-5 but dropped four-point decisions to Waterville and Winslow. Foxcroft Academy is 5-5 with a 53-41 win over Winslow after losing to the Black Raiders 64-30 earlier this season. John Bapst of Bangor is 4-7 with seven and nine-point losses to Waterville.